John Devereaux Thompson was born on August 6, 1917 in Franklin, Pennsylvania and raised in Canton, Ohio. He was the oldest child of William McKinley Thompson, a traveling salesman and Margaret Devereaux, a mathematics teacher. His mother's faith helped shape the man. She was Irish-Catholic and he inherited her facility for mathematics. Her sudden death in childbirth when he was 12 imbued him with a lasting fascination with all manner of things Catholic and countable. Thompson entered Bellevue Hospital's Mills School of Nursing for Men in New York City. At Bellevue Thompson developed splendid social skills, especially conversation, dancing and a love for music. He completed the Mills Training School program in 1939 and said later: "What I didn't realize was that the experience would mark me forever. It is impossible to become a nurse in a place like Bellevue and not have the imprint remain with you the rest of your life." After a short stint in nursing practice, Thompson enrolled in the Navy prior to the start of World War II and served as a pharmacists mate on the aircraft carrier, USS Ranger. His father had taught him cribbage, a card game that brought him a trophy from his shipmates and a lifelong love for the game that he passed on to his children. After the war he returned to New York and enrolled at City College of New York, working nights on the Bellevue Prison Ward, receiving his bachelor's degree in 1948 in business, with distinction. Thompson decided to become a hospital administrator and went to the new program at Yale University. The course of study was one year with a second year of residency at Montefiore Hospital where he stayed for the next six years working first for Dr. E. M. Bluestone and later for Dr. Martin Cherkasky, both Montefiore Hospital directors. Thompson was married in 1955 in Staten Island, New York to Andrianna Natale, MD, a surgeon he met at Montefiore, and together they produced seven children. Thompson returned to Yale in 1956 and sought out a partner in Bob Fetter of Yale's Administrative Science Department. Together they created an array of statistics applied to hospital operations. Thompson was a confidant of Yale President Kingman Brewster, for whom he re-organized the hospital by-laws to accommodate the merging of Grace and New Haven Hospitals. A student of history, Thompson regularly read and wrote on the history of hospitals, nursing and medicine. Together with Grace Goldin (1975), he produced a well-known book on the social and architectural history of the hospital. He repeatedly returned to the reading room of the British Library of the British Museum where he poured over 19th century letters, books and documents in an effort to understand the genesis of, and then expand on the work of Nightingale. Nightingale's writings on mortality differences among London hospitals explained by differences in both case mix and sanitary state was of particular interest to Thompson. John Thompson developed Diagnosis Related Groups or DRGs. In doing so he provided the basis for changing the system for hospital payment. The Reagan Administration and Congress in 1981, seeking an end to hospital cost inflation, started using Diagnosis Related Groups based on the Prospective Payment System for hospitals under the Medicare Program. The new hospital payment system, soon adopted by Medicaid and private insurance companies, paid hospitals a flat amount per case, depending on the diagnosis and treatment, rather than a proportion of total hospital costs. More than two decades after their introduction, DRGs continue to challenge administrators as they are now also used to establish managed care contracts, the source of continuing financial uncertainty for hospitals. Thompson was a colorful teacher sporting a distinctive moustache, a Munimaker cigar, and in later years, a sportsman's vest that, after the DRG was adopted for use in Medicare reimbursement, he referred to as his flak jacket. He used the language of the Navy to illustrate important points and inculcated his students with the need for data to buttress any professional argument. At the same time he never let anyone forget the patient came first. Thompson had a long and productive professional association with the Yale School of Nursing and the professional nursing community in New Haven. His joint appointment to the faculty there began with Dean Florence Wald and developed under the clinical programs of scholarship and care that flourished under the leadership of Thompson's special friend and fellow opera lover, Dean Donna Diers. Thompson loved classical music. On his official retirement from Yale (he never stopped working there) in 1988, his former students presented him with a round trip ticket to Vienna where he enjoyed the opera season. 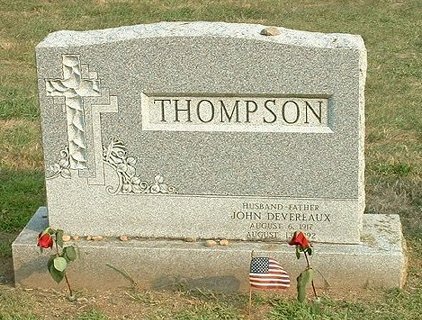 Thompson died in New Haven on August 13, 1992, just after his 75th birthday. He is buried at St. Lawrence Cemetery, right across the street from the Yale Bowl. John Devereaux Thompson will long be remembered for his DRG work. He was, however, a unique and special nurse, teacher, scientist and historian. He was an authority on every aspect of hospitals, their history, construction, management and financing. It was as if he never left the hospital institution that he had walked into as a 19-year-old nursing student. He derived his interest from a wide array of texts, heroes and heroines, prominently among them, Florence Nightingale. Dr. Joyce Clifford, an eminent American nurse, said Thompson helped humanize the hospital administration field. Nightingale, F. (1863). Notes on Hospitals, 3rd Edition. London: Longman, Green, Longman, Roberts and Green. Thompson, J.D., Fetter, R.B., Mross, CD (1975). Case-mix and resource use. Inquiry, XII: 300-313. Thompson J.D. (1977). Applied Health Services Research. Lexington, MA: Lexington Press. White, W., (Ed.). (2003). Compelled by Data: John D. Thompson, Nurse, Health Service Researcher, and Health Administrator Educator. New Haven: Yale University, Department of Epidemiology and Public Health.